This post is pure cut and paste, respectfully. Go here to see the original post. I should just add that the NFB’s Hothouse program is one of the most important and vital film-making opportunities in Canada. There aren’t lot of chances for emerging film-makers to get funded, so the role of the NFB in this area is vital. The National Film Board of Canada seeks submissions from emerging (young and not-so-young) Canadian filmmakers and artists intrigued by animation art, for the 10th anniversary edition of Hothouse, a 12-week paid apprenticeship in full-on, all-inclusive, real-world animation filmmaking. Each year we introduce a theme and invite you to present ideas inspired by it. This year, we celebrate our 10th anniversary by going back to our roots – back to what makes animation such a unique form of expression, subversion, and satire. We’ve trolled through a wealth of archives and discovered 20 audio clips that are intriguing, unusual, unnerving, or somehow full of subtext and hidden meaning. We want you to select one clip and tell us how you will re-interpret the audio to comment on or play with the original meaning. Click here for the raw audio options. Hothouse continues to be about re-imagining ways of making animation, ways that are faster, more flexible, and which embrace the many possibilities in the animation process while maintaining creative and technical excellence. We’re looking for six new talents who are willing and able to jump head-first into this intensive experience. “I wouldn’t trust Norman around the corner as a philosophic thinker. That’s not what Norman is for. Norman is for Hen Hop. Hen Hop. That’s wonderful. And so many other things. That’s his basic gift. He’s got joy in his movement. He’s got loveliness in his movement. He’s got fancy in his changes. That’s enough”. Neighbours garnered great critical acclaim, including an Oscar® for Best Documentary short, proving that – as joyous and fanciful as Hen Hop is – animation can also be a powerful tool for commentary, subversion, irony and satire. That, plus our ever-lasting love and admiration for sharp wit and clever humour such as seen in the works of Nick Park (Creature Comforts) and JJ Sedelmaier (Saturday Night Live’s Fun With Real Audio). It is the thoughtful relationship between content and form exemplified in these works – and there are others – that drives Hothouse as a boundary-pushing creative experience. Submissions must be received by 5pm (Montreal time) on Monday July 7, 2014and must be sent via email (no snail mail submissions will be accepted). The six successful candidates will be notified by Friday July 25, 2014. Your proposal must be based on this year’s theme and one audio selection from the options provided. You are free and expected to be imaginative and bold in how you interpret the sound. You can propose any animation technique that is feasible within the Hothouse framework and with which you have ability. It’s important to reveal a thoughtful relationship between your concept and your chosen technique (whether hand-drawn, stop motion, 3D CGI, collage, 3D printing, stereoscopic 3D, mixed media, etc). We’re open to ideas that involve interactive or real-time elements (Kinect, Oculus Rift, machinima, data visualisation, Processing, etc) but you must demonstrate a thoughtful reason behind the use of technology. Your proposal must demonstrate that you have the necessary know-how to execute the project as proposed – including working in collaboration with the Hothouse 10 team in Montreal. The film must be done in the 12-week allotted timeframe. Project viability is a key deciding factor in the mentoring team’s selection process. Your chosen audio clip will form the basis of your sound design. Describe how you would edit the raw sound, for length and for concept. No original music will be added. Sound effects, foley, and ambient sounds can be added if they help to support the overall concept and create cohesion. Be explicit about how you envision your sound design and whether the audio will be used as is, or whether edits or embellishments are important and why. In all cases, sound design and editing will be done by the Hothouse 10 Sound Designer at the NFB in Montreal. 1. A one-page statement outlining your idea and intent, artistic approach, and motivation for participating in Hothouse. Explain the relationship between your choice of audio and the concept you want to convey. Include one paragraph outlining any specialized equipment needs (hardware, software, props). 2. Two or three design samples (to demonstrate the look and feel). 4. One example of a previous film (animation or otherwise) no more than 5 minutes, or an excerpt from a previous film, no more than 5 minutes. Please send only 1 option. Media must be submitted as a URL. See instructions here. Do not send hard copies. If you don’t have a finished film don’t worry, but make sure you show off what you can do in your writing and design samples. We look for: strength of idea; your ability with the chosen animation technique; your conviction of vision, creative maturity, originality; your willingness to embrace the Hothouse challenge. 1. Propose the film you want to make, not the film you think the NFB might like. We don’t like that and will roll our eyes at you. 2. Pay attention to clarity of idea and intent in your proposal. If you’re unsure about something, admit it and explain why and what you intend to do about it. 3. The thematic constraint is a test of your creativity, ingenuity and, artistic maturity; don’t be afraid to play with it, subvert it, deconstruct it, both in content and in form. Remember, over a hundred people are thinking up ideas based on the exact same material. 4. Ambiguity is not a virtue in a proposal. Cinema is a two-way conversation so someone other than yourself must be able to understand/feel/appreciate/be provoked by what you’re saying. 5. Become familiar with Hothouse. Check out the films and behind-the-scenes videos from past Hothouse editions for a better idea about the projects and process. See Hothouse films here. 6. Be sure to read the Rules & Regulations for a better understanding of what we expect from you and what you can expect from us. Hothouse participants will direct an animation short, maximum 1 minute in length, from creative inception all the way through final sound mix and video release in twelve intensive weeks. The NFB provides – within reasonable limits of budget and availability – the tools, resources, advice and support to master this challenge within the filmmaking community of the NFB. 1. Each Hothouse participant receives a fixed artist’s fee of $6,500. 2. Ideas must be based on the proposed theme, Overheard, and the audio material provided. 3. Projects can use digital or analogue techniques and must be no more than 1 minute in length. They must respect the parameters of Hothouse including available resources and expertise in the Animation Studio. 4. Participants must be able and prepared to work full time beginning September 8 until November 28, 2014. 5. Travel arrangements for those living outside the Greater Montreal area will be made by the NFB in August. The NFB will pay for the single return trip to Montreal and back, at the best possible rate. A modest stipend will be offered to those from outside the Greater Montreal area to help defray actual costs of local accommodation for the twelve weeks. Participants are responsible for finding their own housing. 6. Participants must be prepared to work with the NFB creative team, which includes Mentoring Director, Producers, Digital Imaging Specialists, Sound Designer, Editor, and the rest of the NFB Animation filmmaking community. 7. Participants must be prepared to engage fully, which includes mandatory work-in-progress reviews and workshops, discussions with producers and creative and technical crew and frequent contribution to the NFB Hothouse 10 blog. 8. Participation with and inclusion in any accompanying Hothouse documentation (ie. making-of) is granted by all Hothouse participants by virtue of accepting the Hothouse offer. 9. Adherence to five locked delivery dates: offer response, story sign-off, picture-edit lock, final mix, video online. 10. All projects belong to the NFB and will be released as is deemed suited to content and format. Hothouse productions will be full NFB intellectual properties created under the direct supervision of an NFB producer and subject to NFB administration, distribution, and creative controls and standards. Full copyright and exclusive distribution remain with the NFB. Hothouse is an apprenticeship program for emerging Canadian filmmakers. Located in Montreal, Quebec, it was created in 2004 by NFB Animation Studio producers Michael Fukushima and David Verrall. The aim is to make animation more quickly and more flexibly in celebration of the shortest of short forms while maintaining the hallmarks of NFB animation: creative and technical excellence. This is not “quick and dirty” but rather “intense and amazing.” Think of horticultural hothouses where gardeners create optimal growing conditions to encourage the flowering of exotic orchids and other blooms in weeks rather than months. This program is for Canadian emerging creators from across the country with the imagination, vision, experience and enthusiasm to relish the Hothouse challenge, to flourish in the Hothouse environment, and to accomplish the making of a successful project within the program’s parameters. Key aspects of Hothouse include the active participation of an experienced mentoring director, a team of NFB technical and post-production experts who support the filmmakers, and emphasis on the role of the producers as creative partners, all of which highlight the collaborative process of NFB filmmaking. 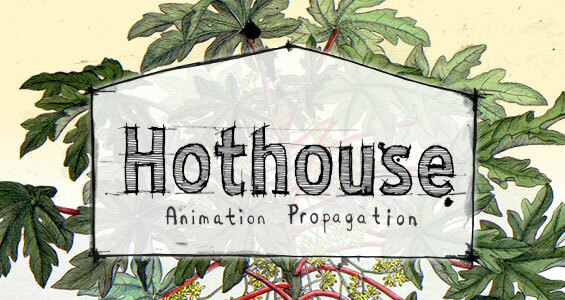 Hothouse takes place over 12 consecutive weeks in the NFB’s Montreal Animation Studio. Not merely funding nor school: Hothouse is instead a 3-month apprenticeship in real-world animation filmmaking. Created in 1939, the National Film Board of Canada (NFB) is a public agency that produces and distributes films and other audiovisual works, which reflect Canada to Canadians and the rest of the world. Since its beginnings, the NFB has played a crucial role in Canadian and international filmmaking. Initiated by Norman McLaren 73 years ago, animation filmmaking at the NFB has been recognized ever since as a cornerstone of NFB activity, garnering many international awards for excellence and innovation. Today’s NFB continues the commitment to a diversity of eclectic and experimental exploration of animation as art. The panoply of artistic visions, driven by the passion and imagination of their creators, reflects novel styles, methods, subjects, and cultures and is expressed across the country. This entry was posted on Friday, June 6th, 2014 at 9:06 am	and is filed under News. You can follow any responses to this entry through the RSS 2.0 feed.